We fully understand that you, the owner would like HIGH OCCUPPANCY RATES and LOW EXPENSES, CREATING A POSITIVE CASH FLOW while your investment is kept clean and well maintained. We understand and recognize the value of creative marketing. We have resources for high-quality/low-cost vendors, and we negotiate for volume purchases and better rates. Our extensive experience with home maintenance allows us to plan ahead with efficiency. The 5-Star maintenance personnel are extremely efficient and make sound decisions. Analyze the market and set rental rates to make you the most money. Show properties to potential tenants and attain a complete application from each prospect. Income qualification and screening of each applicant = less tenant turn over. Complete a move-in orientation and checklist with each tenant so that expectations are clear. Prepare the unit promptly upon move-out for maximum cash flow. Advertise carefully and creatively for vacant units - owners will be charged at-cost for ads. Disbursements for utilities, insurance, mowing, plowing, taxes, insurance, and mortgages will be at-cost. Provide fully computerized accounting wtih Appfolio property management software. Statements will be emailed the 1st of each month. Provide systematic maintenance in the most efficient manner possible. Arrangements will be made for lawn care and snow plowing on vacant properties. Provide 24 hour emergency maintenance service. Handle evictions/collections promptly and professionally. 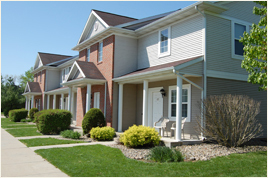 We have the knowledge and resources to handle all tenant problems and complaints. It is our goal to be a cost effective and reliable buffer between the owner and the tenant(s).